+++ RE-SCREENING +++ 18h30 @FNCC. Entrance is 20,- Nam$. In partnership with Africiné. 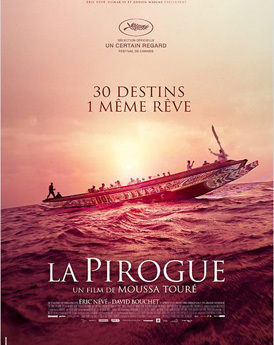 AfricAvenir, in partnership with the Franco Namibian Cultural Centre (FNCC) will show once more the Senegalese/French feature film La Pirogue, directed by Moussa Toure, on Wednesday, 12 February 2014, 18h30, at the FNCC. Entrance is 20,- N$. After having premiered the film in Namibia in March 2013, AfricAvenir and the FNCC jointly decided to re-screen the film, due to the high importance of the issue the film Toure addresses in his film. Amongst other prizes, the film won the Bronze Stallion at the Pan-African Film & TV Festival of Ouagadougou (FESPACO) in 2013. At the FNCC, Entrance 20,- Nam$. The screening is supported by Institut Français (and Africiné). « La Pirogue » tells the story of Baye Laye (Souleymane Seye Ndiaye), a boat captain who hails from a fishing village outside Dakar. It follows his ordeal after he agrees to take a pirogue containing 30 men to Spain’s Canary Islands in search of a better life in Europe. Capably directed by Moussa Touré, a sometime politician and bittersweet chronicler of his country’s social woes in several previous dramas and documentaries, this Un Certain Regard entry at Cannes is dedicated to the 5000 or so Africans who have died trying to cross to Europe in the last decade. Baye Laye is an experienced fisherman and family man who is being forced by economic and moral pressures to reluctantly captain a refugee boat for a Dakar-based people-smuggling operation. After some tense negotiation, Baye Laye and his human cargo of around 30 souls set out from Senegal in a mood of strained optimism. Predictably, their crossing soon becomes a nightmarish ordeal. A female stowaway (Mame Astou Diallo) causes friction among the otherwise all-male group, while minor tensions simmer across ethnic and religious divisions. Passengers sicken and die, others are washed overboard in storms. A harrowing encounter with another pirogue, floating on the high seas without food or power, becomes an ominous portent. Soon Laye’s boat itself suffers a similar fate, its engines shutting down, its course pulled out into the mid Atlantic by powerful ocean currents. The vessel begins to drift – and so, alas, does the plot. Handsomely shot in fairly conventional style by a mixed Senegalese and French crew, La Pirogue is a well-crafted melodrama in classic issue-movie mold. The cast are capable, the dramatic conflict punchy, and the soundtrack sprinkled with the pretty, sinewy, laidback sounds of Senegal, a nation rightly famous for its vibrant music scene.